Cooking is like music making: after a few centuries of fiddling with a definite number of ingredients it starts getting more difficult to come up with a totally novel combination. How excited can you get with yet another pumpkin soup recipe if every autumn those pop up on the food blogs like the mushrooms in the autumn forest? Not that this fact makes me give up. For a while I've been playing in my mind with a range of ingredients to brighten up the pumpkin flavor and went reading around for inspiration. What about putting in your pumpkin soup some red lentils to make it even a heartier fare? Or adding coconut milk and ginger to bring in some tropical sun and taste to a gloomy autumn day? Or maybe throwing in a bunch of Indian spices to steam the kitchen and yourself before the cold kicks in? Or yet better - pouring in a few drops of Amaretto to get merry and carefree Italian-style? I have nearly got lost in all the flavors that my imagination composed as I read through all those exciting recipes. Eventually I have settled on adding ... nothing but olive oil, salt, freshly ground pepper and a bit of cream. Not that I gave up. My plan was to play with the flavor of the pumpkin itself by roasting it in a special way. And the long list of the ingredients that I thought would complement the pumpkin well went into .. the herb bread that I made to serve with the soup. The combination was fantastic - thick and smooth solo of the pumpkin to the accompaniment of the notes that bring one flavor after another - and all of them culminating in the perfect harmony of the sound, taste and feel of the autumn pumpkin symphony on my kitchen. 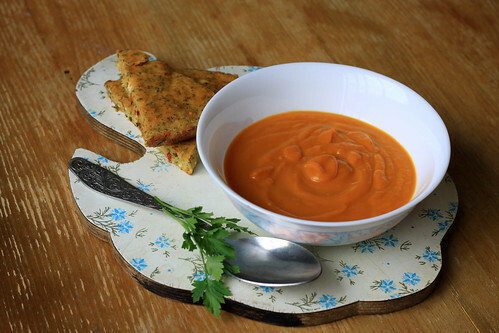 This easy to make and delicious pumpkin soup with the battery texture will warm, comfort and cheer you up on a cold gloomy day. 1. Roast the pumpkin: Preheat the oven to 180C (360 F). Wash the pumpkin. With a large sharp knife half it and with a table spoon remove the seeds from the middle. Cut the pumpkin into wedges (thumb-wide in their widest part) and peel each wedge. Place a sheet of baking paper on a baking tray and grease it with the olive oil. In a small bowl combine olive oil, salt and pepper: rub a bit of this mixture in all the sides of each pumpkin wedge. 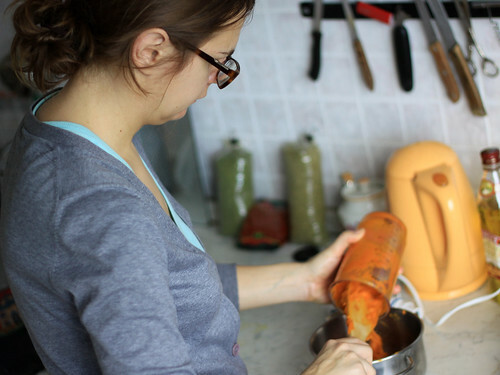 Yes, rub the oil not just sprinkle over pumpkin - it really is the key to the most delicious roasted pumpkin you can get without fussing about additional ingredients. I prefer rubbing the oil in with my fingers so it does soak in the pumpkin. 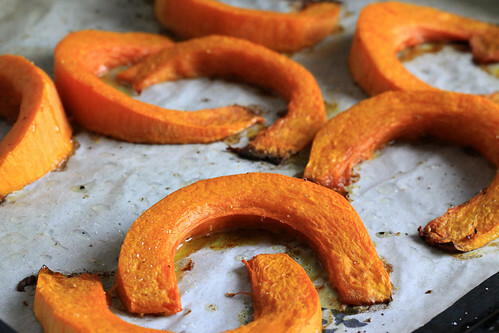 Place the oiled pumpkins on the tray and send to the oven. Bake until soft (about 30 min). 2. Make the soup: If there are any burned edges on the pumpkin, remove them. Then puree the roasted pumpkin in the blender until smooth. Add cream and mix in well. Add as much boiling water as you like to arrive to the texture you want. I prefer my pumpkin soup on the creamy side hence I've added a bit less than a glass. Add salt to taste, if needed. Blend more to the perfectly smooth and creamy texture. Put the soup back on fire to warm it up but do not boil. There is just a bit of cream added yet it may curdle from boiling and your perfect texture will be gone. We don't want tears, we want a good pumpkin soup - so keep an eye on it and remove from the heat just when you spot the first bubble on the surface. 3. Serve: Serve hot with the herb bread. Aroma of the herbs coming from the oven will keep your near and dear glued to the kitchen counter until then can get hold of the yummy bread and eat it to the last crumble. 1. Preheat the oven to 180C (360 F). 2. Make the batter: In a large bowl mix in the cottage cheese, yogurt, milk, egg and olive oil and mix well. Then add in the all the other besides the flour and baking powder and mix to ensure they spread out evenly. Add baking powder and gradually start adding the sifted flour to arrive to the texture of thick muffin batter. You don't need to fuss a lot about this batter - it will stay crumbly - and it's the beauty of this bread. 3. Bake: Grease a round metal baking pan (about 20 sm in diameter), transfer the batter there and bake for 35-40 min. 4. Serve: Remove the bread from the baking pan, place on a towel / wooden board and let it cool down. It is best served cold and consumed on the day of making. Looks yummy!! The bread is wonderful!! Now this is wonderful, never has anything like it myself but the flavors jump off the page. Disclaimer: I do not receive commission or any other payments from the businesses and people mentioned on my blog posts. I write about them because I have personally used their products, services or personally know them and have full trust in them, their products and services. Reproduction of any images or texts from this website without an explicit permission of the author will be considered a violation of the intellectual property rights. Copyright Olga Tikhonova 2010. All Rights Reserved.